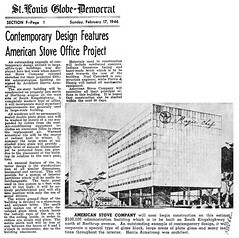 This article in the St. Louis Globe-Democrat newspaper announces the construction of the Magic Chef Building. Although the last sentence of the article reads, "It is hoped that construction can begin within the next 60 days," in fact, the architectural design and construction documents were still being drawn and engineered through the spring. The first date on the construction documents was 27 May 1946. Revisions were completed by 14 June 1946. The rendering shows the building with large script lettering along with the Magic Chef logo across the top of the east facade. Armstrong subsequently modified the this drawing relocating the logo to the lower left corner of the same wall and reducing its size (making it left-justified).